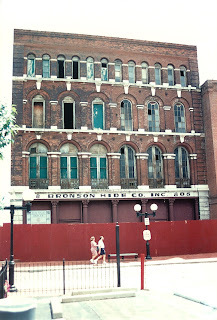 Will the Switzer Building meet the same fate as the Bronson Hide? 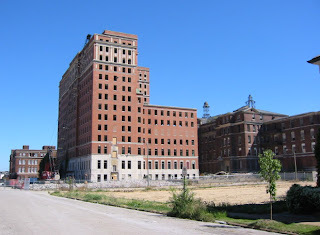 With the exception of Chouteau's Landing, Laclede's Landing is the only surviving portion of street grid remaining from the original settlement of St. Louis (about 40 blocks were demolished in 1940 to clear the site that would become the Arch grounds). 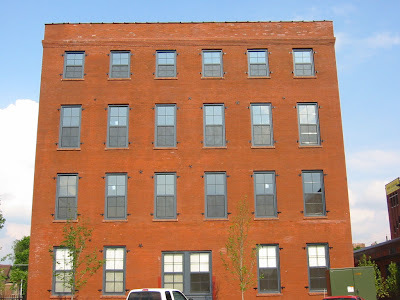 The surviving buildings were constructed between 1844 and 1905, when commerce in St. Louis was still firmly based along the river. 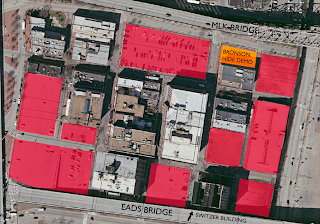 As the graphic below show though, about half of the buildings of Laclede's Landing have been lost and are now parking lots, a garage and vacant lots. As mentioned in my last post, there are many examples of buildings in the condition of the Switzer that have been successfully rehabbed. 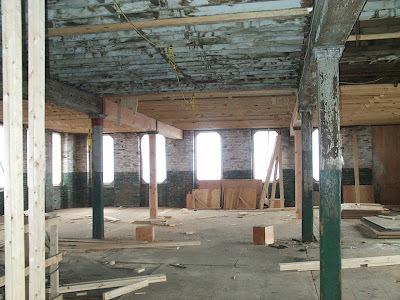 Below are a few more photos of the Lister Building as it's interior was reconstructed. 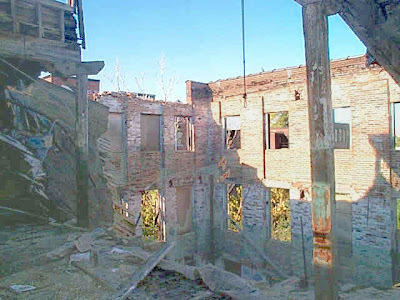 Note in the first photo clear sky visible through the 4th floor windows, new floor joists looking in 2 & 3, and the massive debris pile from the collapsed floors in the first floor retail space. 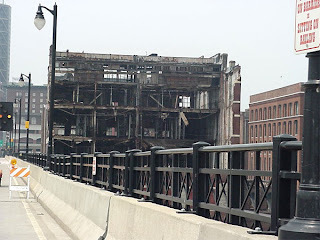 Another building that had suffered what would appear to be catastrophic damage and was resurrected is the M-Lofts. 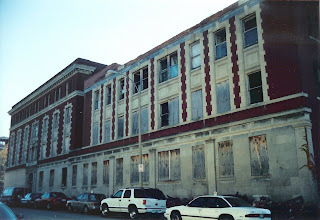 in 1999, the former factory building of the International Shoe Company had seen better days. 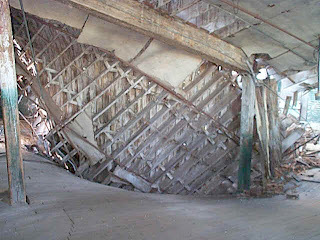 Almost 30% of the floors of the building were collapsed in the basement, and about 80% of the roof structure had fallen to the floor below, meaning that the remaining floors would not last much longer. 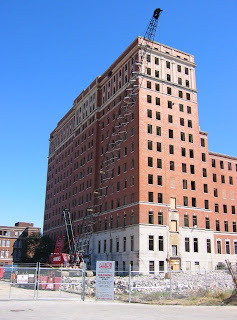 All of work was eligible for historic tax credits because it involved re-building the original fabric of the building. 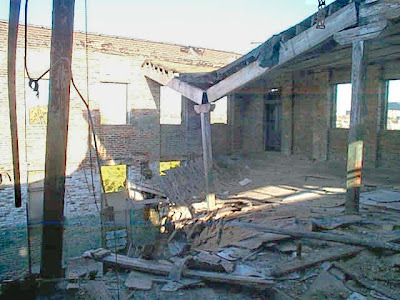 An alternate to re-building the original structure of a building that could be considered in an extreme case as the Switzer is the concept of preserving the front facade or a portion of the front of the building and building a larger new construction behind. 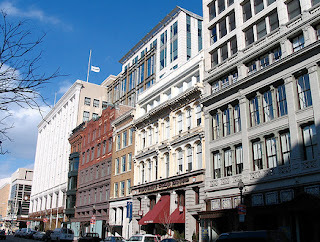 This concept has occurred in many cities across the country (often with buildings in perfectly good shape) as a compromise between preservation and the pressures of denser development. Below is an example in Washington DC (center of image). 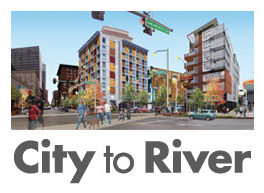 Apparently this was also considered by another developer for the Switzer as seen posted last year on Urban St. Louis. This type of approach however would not qualify for historic tax credits. 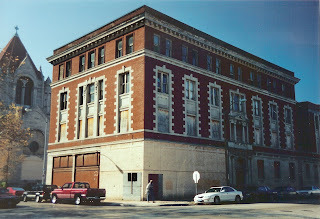 The Lister Building Annex was built in 1914 as an expansion of the Lister Building next door that had been built in 1905. Both were designed by architect John L. Wees and housed medical offices until they were abandoned many years ago. 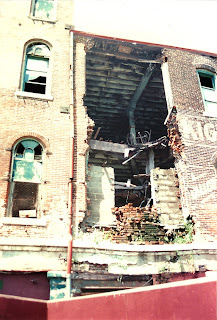 In 1999, gusty winds caused the front parapet of the Annex to tumble off the building onto the sidewalk below along Olive. 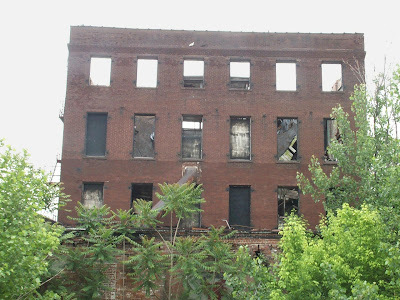 At the time, the buildings were owned by the City of St. Louis, and the Annex although having suffered only minor damage was declared a public hazard and demolished. The site is currently occupied by a dog park and community garden, but will likely be developed in the future. Fortunately the larger Lister Building at the intersection of Taylor and Olive was spared. 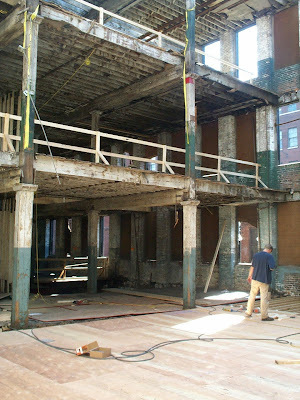 In 2001, Uan and Sue Nguyen of Central West End Builders bought the building and embarked on the challenging task of re-building. 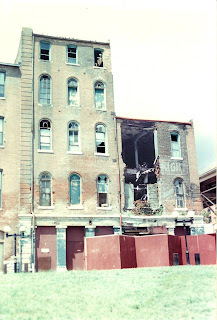 This was no small task, considering that when the Nguyen's bought the building, over half the floors and roof were already in the basement, and what remained was not salvageable due to rot. 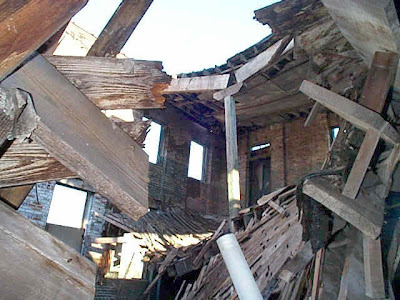 As the photo below from the building's website dramatically shows, the building was literally a shell with four walls and some interior columns and beams. 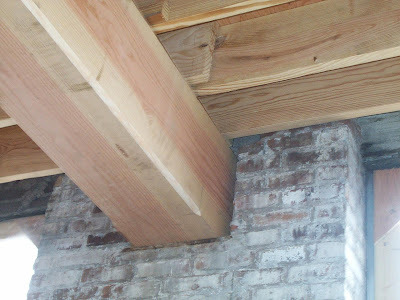 The floor at the top of the photo is all new construction. The project endured another setback during construction, when the fourth floor of the east wall collapsed, but the they simply re-built the wall and moved on with completion. The building now houses well appointed apartments as well as a furniture store and coffee house on the first floor. The building received a most enhanced award from Landmarks in 2004. 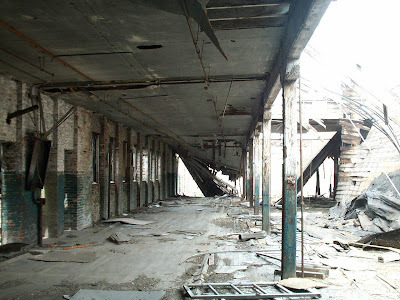 Update - from a comment by Michael Allen on the Urban St. Louis site: "Metro wants the building demolished, because they are afraid it will collapse onto the MetroLink station in the Eads Bridge. The federal reviewers are not allowing tax credits for the building's rehab, effectively killing the project. Rothschild would prefer to rebuild, but without credits can't make it work." With Bohemian Hill in the news recently with the proposal for an auto oriented shopping center and the destruction of the only remaining block of original urban streetscape along Tucker/Gravois between downtown and McNair, as well as an innovative example of contemporary residential infill in harmony with its historic surroundings, I thought it would be appropriate to reflect back on the de-urbanization that occurred north of Lafayette Avenue. 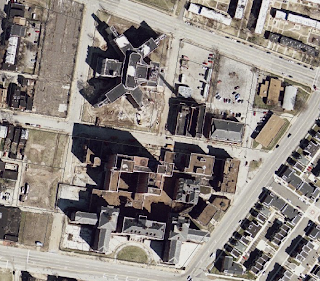 The aerial photo below from 2002 shows the City Hospital site as a fairly dense urban village with the old Administration Building along Lafayette, the 13 story Tower Building at center fronting on Carrol Street (notice how Carrol connects to the residential area to the west), and the 6 story former Malcolm Bliss Mental Heath Center along Park Avenue. 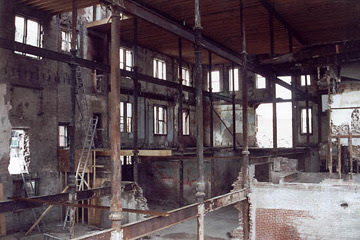 In late 2002 demolition began on Malcolm Bliss and the Tower Building prior to the conversion of the Administration Building into the Georgian Condominiums by Gilded Age. 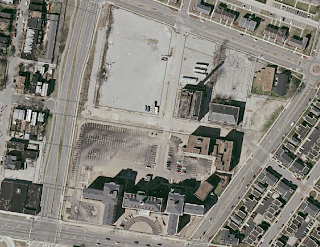 Fast forward to 2006, and you can see that the Tower Building has been replaced by a lovely asphalt surface parking lot and the Malcolm Bliss site is covered in gravel and seems to have an undetermined future. The situation is not helped by the way the Truman Parkway cuts off the site from the residential neighborhood to the west. With the new roadway and demolitions, the Georgian becomes an isolated island all by itself. The X-shaped Georgian revival Malcolm Bliss building, designed by Albert Osburg, which opened in 1939 was the first to be demolished in early 2002 (if you look closely at the aerial above, you see the southeast wing already going down). 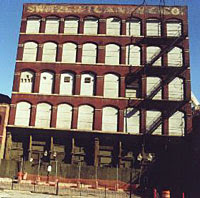 Despite the later additions, the original building was worthy of saving and could have made great apartments or condos. Why was it demolished? The thought occurred to me that maybe people would not want to live in a former asylum, but a quick search shows that several former asylums around the country are being converted to housing and including one in New York and a massive mixed-use complex in Traverse City, Michigan. 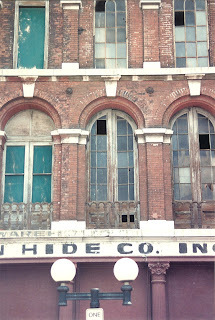 Unfortunately I did not photograph the building before its destruction, so please visit Built St. Louis for photos of Malcolm Bliss as well as the other buildings in the complex. The Tower Building, also by Albert Osberg, was built in 1942 as part of a major expansion of the hospital. The building was a handsome structure that could be mistaken for one of the classic hi-rise apartment buildings on Lindell but for its location. At 13 stories, the building commanded amazing views in all directions including some of the best views of downtown. One can only imagine how fast upper floor condos would have sold out in this building! Once the modern ancillary and connector buildings were demolished, there was still room west of the tower and between the buildings to do a low parking structure to serve the buildings. Addtionally, as with buildings downtown, it only takes some imagination to squeeze parking spaces into basements and lower floors of existing buildings. The Tower Building's last stand below in early 2003, with the south wings already demolished. See stlouiscityhospital.org edited by Michael Allen and Claire Nowak-Boyd for amazingly comprehensive information about City Hospital and it's history.